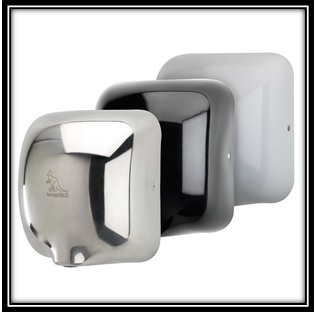 The eye catching Eco Hand Dryer comes in a state of the art contemporary design, while also providing unbelievably fast and efficient hand drying with every use. The dryer provides a choice of the highest quality polished stainless steel, white enamel powder coating or black powder coated steel casing, as well as having an upgraded motor and heating element that together ensure a combination of striking looks, strength and impressive drying in any washroom. The super powerful airflow cuts hand drying time to an exceptionally speedy 8 – 10 seconds, which massively lowers energy consumption and dramatically reduced running costs. With the unique ability to sense the ambient air temperature and adjust the air heater power accordingly, it can use as little as 0.6KW so is a cleverly economical and eco-friendly solution for washrooms in busy offices, bars and restaurants, gyms, education centres and hospitals. The Eco Hand Dryer comes with a 600W brushed motor that delivers high powered airflow at 110 meters per second to literally blast the water from hands until dry. The unit itself is sized at just 295 x 325 x 172mm, meaning that this is an exceptionally low energy but high performance, stylish and solid hand dryer.